Building codes require heating and cooling loads to be calculated with the procedures of ACCA Manual J.
ACCA Manual J is the industry recognized method for determining heating and cooling loads which lead to proper equipment sizing. 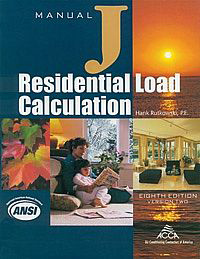 No more basing HVAC equipment size on “rule of thumb.” – The ACCA book on Residential Load Calculation (Manual J) is 556 pages long. It is filled with extensive numbers, equations, tables and worksheets. This type of procedure is perfect for computer software; let the computer do all of the number crunching. However, software from the top software vendors can be expensive; greater than $400 for basic Manual J Calculations. An old computer adage is “Garbage in is garbage out.” ACCA will approve and certify that Manual J software follows the proper procedures. But an accurate load calculation involves a great amount of input. And that input must be accurate and appropriate. If these inputs are not known then defaults are used. Default is another term for guess. Manual J was meant to move away from guessing. If the input information is just a guess (garbage in), you have just spent a lot of time and money on what you had before (garbage out). Same result if you don’t have a complete understanding of the inputted data and make a wrong determination. A few little inaccuracies are not likely going make a difference in equipment sizing. But where is the line. Let me do your Manual J load calculations for you. Use my 35 years of commercial and residential load calculating and building energy analysis to your benefit. No wasting hours of trying to understand input tables and charts. Click here for low price of just $87.99. Use my simple two step procedure. Send me drawings and construction details. More info here. Wait for my results, usually a day or two. Complying with building codes has never been so easy and inexpensive. Go here for more on Air Conditioning Contractors of America.